Powers: The Metal Master possesses the ability to animate and control virtually all known forms of metal. He can manipulate metals on an atomic level and across planetary distances. He can alter the shape and form of metals at will, liquefying them, forming complex objects out of them, levitate them, etc. One notable exception is Plandanium, the metal from which the armor of the Spaceknights of Galador is made (at least the cyborg armor, which is fused with his living cells is resistant, anyway). He could affect this Plandanium to some degree, but he could not control it as with other metals. He's also got this major obsession with metal. As an Astran, he is hairless, has four lungs, and has special excretory glands on his stomach. (That's from the OHotMU, and it was all added specifically for the handbook entry, since it has nothing to do with anything the Metal Master has ever demonstrated). History: The origins of the Metal Master are unknown. He comes from the planet Astra which is ruled by a theocracy. The source and nature of his abilities remain unrevealed, though they may be native to his race. (Incredible Hulk I#6 (fb)) <By his own account> - Of all the Astrans, only Molyb was judged a criminal; he was sentenced to eternal exile for wanting to use his great power to conquer all. (Incredible Hulk I#6 (fb)) <By his own account>- "For time beyond measure," Molyb roamed the galaxies, seeking a planet that was rich in metal that he could rule. (Incredible Hulk I#6) - Molyb's ship arrived on Earth, and he used his powers to melt an experimental space probe rocket at Desert Base (Los Diablos Missile Base). After introducing himself as the Metal Master, he detailed his abilities and history, he announced his intent to conquer Earth, at which point General Ross ordered his troops to attack. Molyb easily overcame the defenses the military sent against him by controlling their metal weapons and vehicles. The Metal Master even defeated the Hulk in their first encounter (although the Hulk did have some weird, Ditkoesque deal going on where he had Banner's head on the Hulk's body, and he was wearing a Hulk mask, and...ahh, go read it!). The Metal Master then traveled the Earth, demonstrating his power and destroying various forms of technology, etc., such as oil drills in the Middle East, construction in Africa, shipping in the Mediterranean, and bridges he uprooted in the heart of Europe. The Hulk later returned, armed with a big gun designed to destroy the Metal Master (who failed to realize it was plastic). When the Metal Master couldn't affect the weapon, he was caught off guard long enough for the Hulk to grab him. The Hulk threatened to squish him, and the Metal Master agreed to repair all of the damage he had caused; casting his powers across the planet, he reversed all the changes almost instantly. He left the planet in his starship. (Rom#30 (fb) - BTS) - Upon returning to Astra, Molyb realized he had been duped. Nonetheless, he feared that Earth might have developed a metal not subject to his control. (Rom#30) - The Metal Master returned to Earth, this time claiming to be attempting to procure large amounts of certain types of metals, which his race, the Astrans, thrive on. Wishing to determine whether there was some type of metal he could not affect, he created a number of spider-like drones to scour the Earth and gather samples of all types of metals. He began his quest in Clairton, West Virginia, and his drones incapacitated Clairton Scrap Iron and Junk owner Bernie Tarpin and his dog, Alice. The Metal Master soon discovered he Spaceknight Rom, and Molyb wondered whether Rom's metal armor might be such a super-metal as he had sought. After a brief struggle (in which Rom overcame both the drones and a Molyb-animated monster crane), the Metal Master pitted his metal controlling powers against Rom's armor. Rom fought his control, and knocked him from his hover-disc. Although he was not injured, the Metal Master was driven to the brink of madness by the fact that he had again found a metal he could not control. The Metal Master wandered off into West Virginia (no good can come from that! ), muttering mindlessly to himself. BTS - The Metal Master apparently ended up an inmate in some intergalactic prison. (Maximum Security#1-BTS, 2; 3-BTS) - During the events of Maximum Security, the Metal Master was one of the many aliens sent to Earth as part of a plot to prevent the heroes of Earth from interfering with the actions of other races. The Metal Master briefly tangled with the Scarlet Witch. It is unrevealed whether the Metal Master escaped, or if he was returned to prison, after the events of Maximum Security. The Rampaging Hulk (volume 1, the magazine) #3, features "The Return of the Metal Master." Using a robot called the Ferronaut, the Metal Master returns to attack the Hulk, but loses his powers in the process. The "original" Hulk stories in the first nine issues (after which the title became HULK!) were originally set to be occurring immediately after Incredible Hulk I#6. However, all of these stories have since been revealed to have actually been fictional movies created by the Krylorian Techno-Artist, Bereet. If the stories get ret-conned back into existence, this story will be added to this profile ASAP. 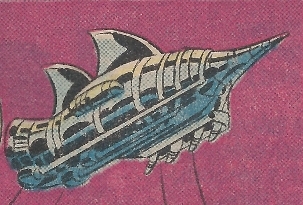 In Hulk#6, the Metal Master speaks as though his abilities are native to all those of the planet Astra (images of his world and his people using such abilities are seen as he describes his abilities and his past.. No such abilities were mentioned in the Astrans entry in the original or Deluxe Edition Official Handbook of the Marvel Universe I#1: Appendix to Alien races. In that same issue, the Metal Master states that Astra is "many, many galaxies away." The narrative text in the same issue refers to the "the endless power of the menace from another galaxy." 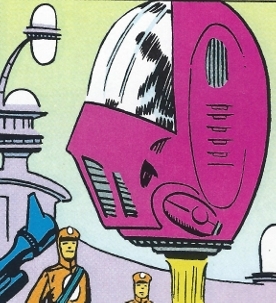 The Official Handbook of the Marvel Universe entries identify Astra as being in the Milky Way galaxy. His original stories describe him as megalomaniacal criminal on a world of peaceful artists. In Rom#30, in which he is decidedly more human and less Ditko-esque/Grinch-like, he plots to conquer Earth for himself so that he would not have to signal an invasion of Earth or call other Astrans to enter the battle...he further notes that he returned to Earth to save face and that such a conquest would lead him to be proclaimed his planet's greatest hero. Metal Master is never seen out of uniform that I recall. The original OHotMU added the information about the secretory glands (though they note them as present on the stomach, but the art makes it clear the glands are in the skin over the abdomen. That handbook also added the information about 4 lungs and spatulate feet. I'm sure if the Metal Master had a last name, it would be Denum. The Metal Master has averaged about 18.5 years between appearances, not including the Rampaging Hulk non-continuity story. So look for him again in 2018! I couldn't get the image from Maximum Security#2 to come out any better...sorry. --I guess Metal's a popular name around the close of the 21st Century.